Theresa E. Gamler | Morrell Funeral Home, Inc.
Theresa E. (Seyler) Gamler, wife of Earl “Butch” W. Gamler, Jr. of 43 years, of Boyertown, passed away on Thursday, November 8, 2018 at her residence. Born in Pottstown, she was the daughter of the late Shirley (Griesemer) Seyler and Earnest W. Seyler of Boyertown. Theresa was a 1974 graduate of Boyertown Senior High School and worked at Tung-Sol/Wagner Electric as a line worker till the company closed. She was a member of St. Joseph’s (Hill) Lutheran Church. Theresa loved to cross stitch and to do crafts. 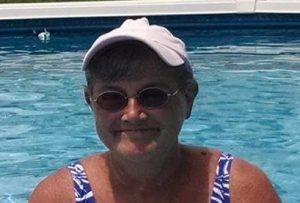 She loved taking care of her flower beds and spending time camping at Pioneer campground in Sullivan County and at their seasonal campsite at Shady Grove campground. She loved anything to do with snoopy. Surviving in addition to her husband, her father and his companion, Kathryn Reinert; are one son, Michael E. Gamler and his wife Sue; one brother, Terry L. Seyler and his wife Karen and one granddaughter, Autumn A. Gamler. Relatives and friends are invited to attend her funeral service on Wednesday, November 14, 2018 at 11:00AM at Morrell Funeral Home, Inc., 124 W. Philadelphia Avenue, Boyertown, PA. A viewing will be held from 9:30-11:00AM at the funeral home. Burial will be in Hill Church Cemetery. I am so sorry for your loss. I only knew her a short while, but could tell she was a wonderful and special person by the love I felt in her home. Thank you for letting me be a part of her. Theresa was a loving woman with a big heart. We know she will be missed greatly by many. All of us in California are broken hearted for her loss and are blessed to have been able to spend time with her and her family several times in the last year. Heaven has a new angel and we have loving memories. God bless her and the family. together ! I always looked forward to new flowers that she would generously share with me and ask that I pass along to others ! Theresa was a very kind and loving soul and I will miss her smile and generous heart!